Location Found: On a wall of an Auchan mega supermarket in Avallon. Out of the hundreds of articles and things that I have brought away from that store, this beetle is by far the best. Incidence: The Elephant Stag Beetle is becoming more and more rare throughout Europe and is, from what I understand of the bureaucratic labeling, a protected species. It is the largest beetle in Europe and is listed by some sources as the largest ‘terrestrial insect’ in Europe. Release Into Wild: In the Morvan forest, Burgundy, across the street from our house. Perched on my hand, he smelled the strong odors of bark, leaf, and soil, opened his wings, and flew off to the amazement, delight and awe of my children and me. Personal Significance: I have seen them dead in boxes (they are terrific adornments for insect collections), have found two of the heads and horns of the male (with the abdomen missing) and have searched decaying wood and gas station lights – probably for the last 25 years – to find one alive. Insect lovers and anyone awed by nature would find the male of this species not only scarily impressive, but benign – a gentle, sharp giant; as far as I could tell with my handling him, he couldn’t pinch me with his horns, though I think the female could. There are certain insects that one in the Western world, away from the tropics, can come across where the encounters are just as amazing as coming across one of the Big Five of Africa, a beautiful person from Hollywood, or the Ivory-billed woodpecker. From experience, the Regal Moth, the Tarantula Hawk, and the Cecropia Moth first come to mind. They are impressive because they are so exceptionally large as insects. Size in insects matters because the bigger one is, the more one can fully take into account the beauty, strength, grace, or absolutely lethal qualities – the fire dust and the thumb-size abdomen of a Regal moth, or the steely-black, incredibly powerful body of the Tarantula Hawk. 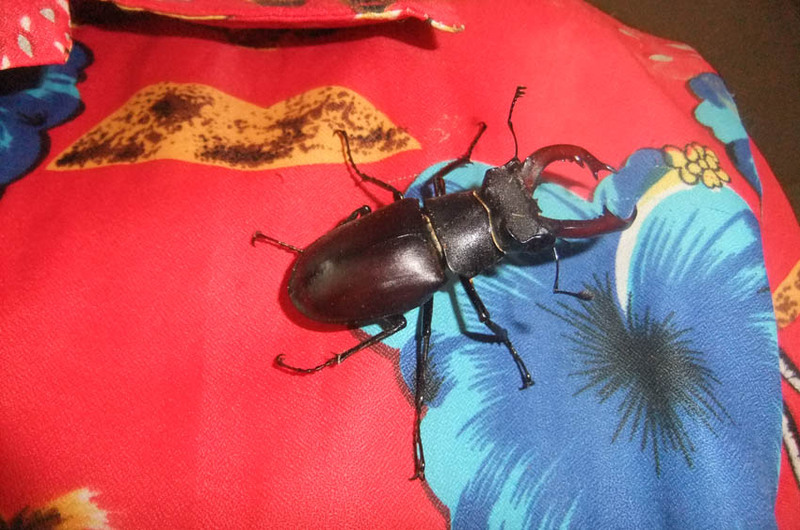 Seeing, holding, handling, sharing and then freeing a live, four-inch long Elephant Stag Beetle was one of those amazingly delightful encounters that takes you back to childhood and throws a bouquet of smiles. Buster Burk is a writer, teacher, and friend of KMZ REB who splits his time between the 18th arrondissement of Paris and a bucolic village in Burgundy. He has been collecting and protecting bugs since he was 12 years old when he caught a classmate trying to smash a Regal Moth with a basketball. Those who love and admire Buster will notice his taste in Hawaiian shirts has not changed over the years. More on the Elephant Stag Beetle *here*.